Despite having arrived at our resort early on Friday morning (as in hours past our bed time), we didn’t want to get up too late in the day. We wanted to begin acclimating to the time zone, but also attend the resort’s guest orientation. Since we didn’t yet have any food, we just made a pot of coffee and headed down to the reception area. The presentation was of some use, but we already have most of our agenda set, so we only had a couple of new things to think about afterwards, in terms of additional excursions, plus we had some suggestions for places to go for breakfast! We decided that Bongo Ben’s would likely meet our needs, so we headed north on Ali’i Drive to find the place. The restaurant was a decent size, and very busy, but it took less than five minutes for us to be seated. The server seated us side-by-side at a bar of sorts that faced the ocean. The menu has some good variety on it, but other than chicken fried steak, not many options for meat that wasn’t pig. I ordered the chicken fried steak with eggs and a pancake instead of toast, along with a pot of Kona coffee. Angie opted for a banana macadamia nut pancake and a bloody Mary. Everything was pretty good, especially the drinks! We knew ahead of our arrival that our first day in Hawaii would be a chore day but we hoped there would be some opportunity to start appreciating our surroundings also. Since the Aston Kona by the Sea, where we’re staying, is basically an apartment complex, we knew we’d need to buy some food for meals and some other things, but that we would need to figure out a meal plan that doesn’t involve buying too many condiments and extras. Our first stop, sadly, was to Macy’s to see if Angie could find a swimsuit and some other clothing. It was partially successful. She couldn’t find any shirts or shorts, but she did buy a swimsuit, though, being Black Friday, it was somewhat painful. The lines to checkout were pretty nuts, but it had to be done. I do have to say that I don’t need to go shopping on Black Friday ever again. Following that, we went to Costco and Safeway to get food (and booze), providing ourselves with food that should get us through until we leave for the other side of the island where our accommodations will not offer us a kitchen. By that point, between shopping and jet lag, we were pretty exhausted, so we went back to the resort to eat some lunch and rest. Lunch was simple. The meat counter at the Safeway had several types of Poke, a raw fish salad, so we brought the sesame poke to have for lunch. It was great. We relaxed for a little while until we felt revived enough to venture out again. While we try not to overschedule ourselves while on vacation or traveling, there are some things we wanted to try to do. Today, we thought it might be a good idea to drive down to Pu’uhonua O Honaunau National Historic Park, especially if we might be able to catch the sunset too. It took about 45 minutes to get there, so we only had about a hour before the park would close, but we were able, even in a short time, to explore and appreciate this special site by taking the self-guided tour. 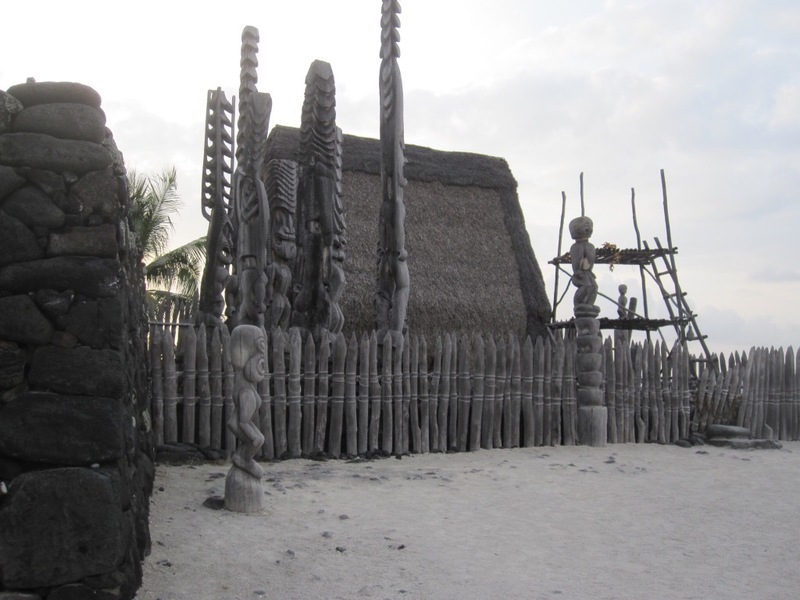 Pu’uhonua O Honaunau, was, among other things, a place of refuge, the equivalent of a sanctuary city. 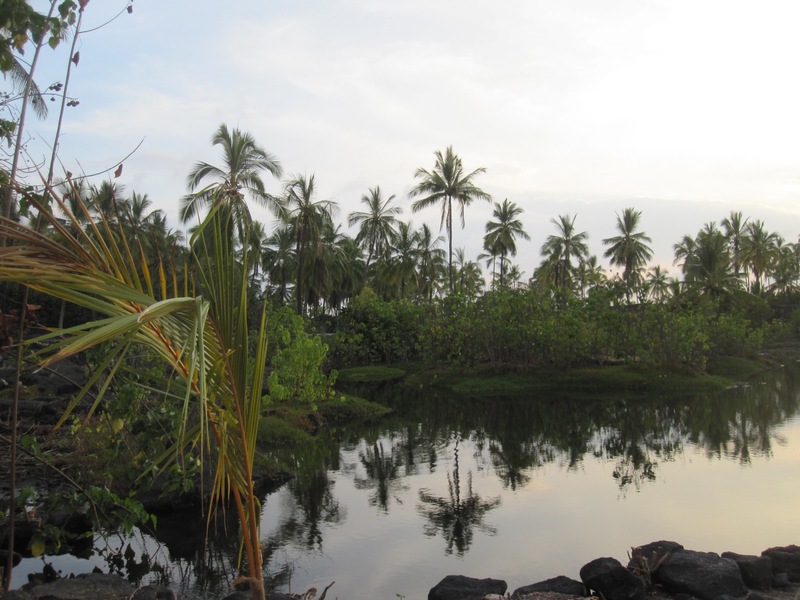 From what I’ve read, a Pu’uhonua was a place of sanctuary for a person who had broken a kapu (the ancient Hawaiian code of conduct), If you reached the confines of the Pu’uhonua, you could no longer be pursued. 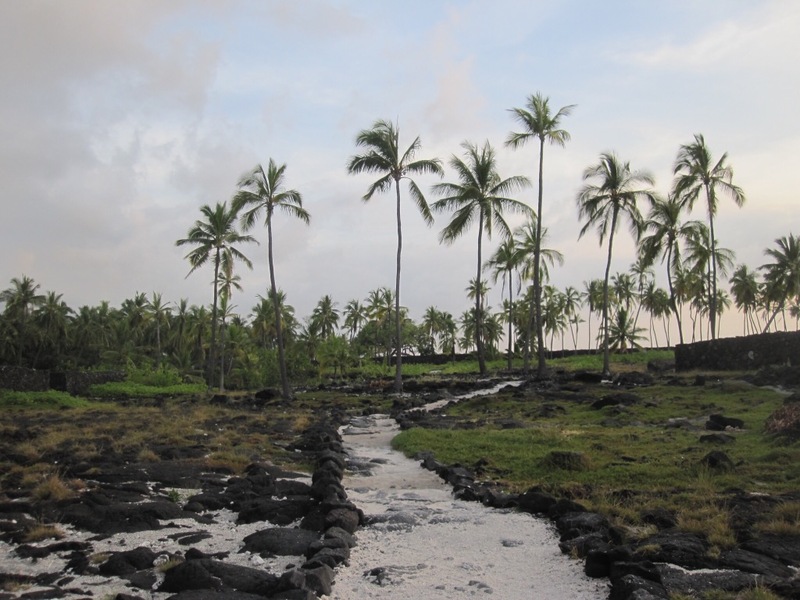 Pu’uhonua O Honaunau was also a royal city, with parts of it barred to the rest of the population. We walked around along the route prescribed by the tour. The park was very peaceful and spiritual. 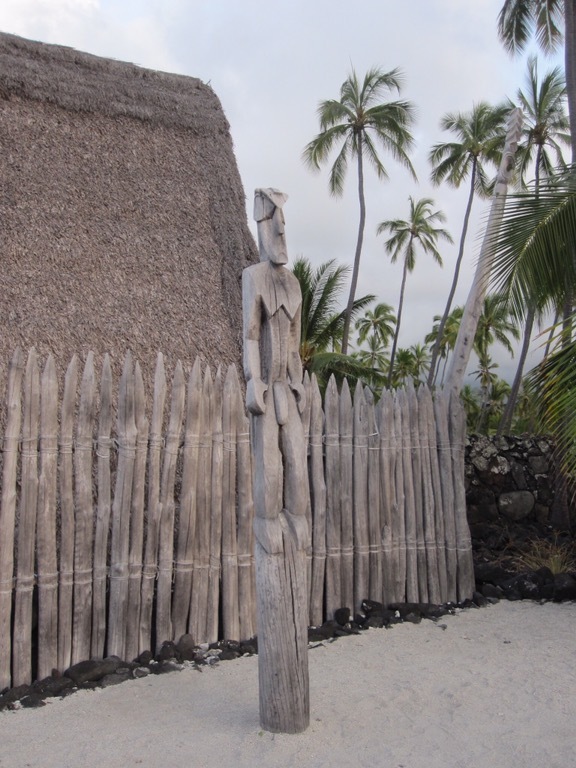 There were some totems between the royal enclosure and the Pu’uhonua, including one in the water that I read was there to warn commoners away, since one of the biggest sets of kapus pertained to not looking at or being in the shadow of royalty. I think we learned a lot about Hawaiian culture in our short visit. It was a great introduction to our stay here. Angie’s note: We also saw a honu (Hawaiian green sea turtle) in the water. The turtles are protected by law, so there are barriers up to keep people off the beach where they like to bask during the day (we were too late for that). I do hope you find real food while you’re there.